Oomph up your personality with Rebul Power Mens Deodorant, which is enriched with the top notes of fruity Bergamot, Grapefruit, Melon and Green Apple. This 150ml deodorant is a perfect fit to carry it along while working out or while playing a sport. It is nourished with the goodness of Green Violet Leaves, Galbanum, Tarragon, Spearmint and Cedar Leaf, and the woody base notes of Cedarwood, Sandalwood, Patchouli and Musk. Additional Information: Rebul introduces a wide range of scents, which give you a lasting fragrance replenishing you with the sense of purification and liveliness. 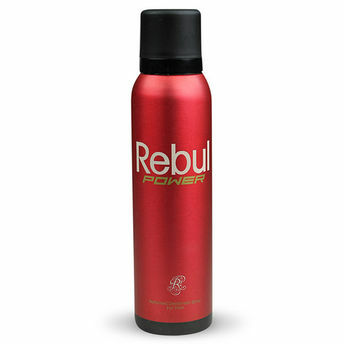 Rebul Power Mens Deodorant offers a sensuous experience giving you an outgoing confidence.